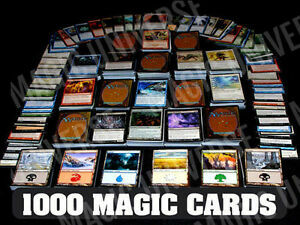 Details about 1000 Magic the Gathering Cards Lot With 100 Lands! MTG! Includes Foils & Rares! Sales tax may apply when shipping to: CA(8.26%), IA*, MN*, RI(7.0%), WA*. Fast delivery. Son will love them. Great seller! Highly recommended! Would buy from again! Wonderful transaction! Fast shipping. Great service. These cards were shipped in an envelope and some were damaged. Negative rating because only received 981 cards. Horrible customer service and communication! Package was late! best value for new or non tournament player. Lies. Only 1 rare, only 2 holos. Barely pluaral. Very unhappy, I only got one rare card in my batch, and only 2 promo cards the ad implies there will be plural of both, which is not the case. I am shocked I received such a bad purchase, when ratings are so high. Great lot for the price. I got 1 Foil common, 3 rares, 42 uncommons, and about 20 special lands both common and uncommon on top of the 100 basic lands in the set. No Snow covered however. Mass majority of the cards are commons. but as a old school player just coming back to Magic it was a great set since majority of the cards are from Guildpact and up. I did get 2 Ice age commons, 1 4th edition, 1 Mirage and 1 revised card in the set. However for me this was fine since i played from Beta to Exodus before I quit. An excellent start to any magic collection. Definitely not the best bulk purchase for getting stuff other than commons though. My batch had about 5 foils. 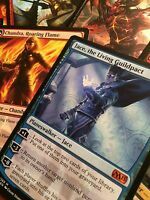 If you are just starting to play magic and want to build your own decks, I highly recommend. Most cards (Id say about 85-90%) were in pristine or good condition. The only cards that look like they have been played are lands from the 90s thrown in. A tip of advice is order bulk lands along with this, as the 20 lands provided is enough for one deck, if you want to make multiple with one color you'll need more. Many other offers for 1000 Magic the Gathering cards are junk. They include almost nothing but duplicates of up to 30 of the same card. This is the exception to the crummy standard. It includes 100 basic lands, not including deserts and dual-mana lands which make the overall mana count close to 125. Many of these cards have duplicates but they max out the number of duplicates at 4, allowing for much less wasted space compared to others' deals which contain 30 of the same card. There are about 400-500 different individual cards that came from the pack that I bought, and I was able to make 5 good decks, one of which stood its own in Magic the Gathering tournaments. 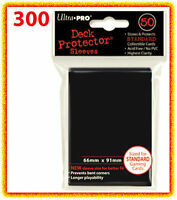 This is a much better deal than every other 1000 card pack that I have seen. Only flaw; the package was beat up in the corners, but this is the post-man's fault, not yours.